WHO : Open to all persons with disabilities who are 5 years of age or older. Physician’s approval required. Complete Participant Medical History Form. Download form here. 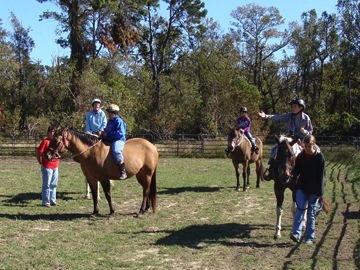 WHAT : Participants will learn to ride and care for horses to the very best of their capability. Lessons are tailored to the specific individual. Opportunities are available for competition in special and inclusive horse shows. WHEN : Currently lessons are held on Saturday and Sunday mornings starting at 9 am, weather permitting. COST : Our sliding fee scale makes this program affordable to all. HOW DO I GET STARTED : Visit Dream Catcher Stables any Saturday or Sunday morning between 8:30 am and 9 am. You will complete the liability release and informational paperwork and be given a brief tour of the facility. Bring the completed Participant Medical History Form with you OR take the Participant Medical History Form home and return it completed on first lesson day. WHAT TO WEAR : Closed toed shoes or boots, long pants or jeans, weather appropriate shirt or top (must at least have short sleeves – no tank tops please). We provide the riding helmets. NOTE: Due to our outdoor facility, lessons are not held during rain or summer heat index of 103º or higher. WHO : School age youth who have been ordered to do community service by the court or their parents. WHAT : These youth will be doing facility maintenance. WHERE : Saturday and Sunday mornings starting at 8 am. Ending time varies, parent or transportation person must be advised each day of pick up time. As we are an all volunteer organization stated pick up time is specific. Please be on time as you are keeping our volunteers from their family activities. WHAT TO WEAR : closed toed shoes or boots that can get dirty. Long pants, jeans, or Bermuda length shorts depending upon the weather. Shirt or top must have a least short sleeves – NO Tank tops or Muscle shirts permitted. Dress for the weather. Pants MUST BE WORN AT THE PERSON’S NATURAL WAIST – NO SAGGING!!!!!!!! No jewelry or piercings allowed. Leave them at home. HOW DO I GET MY HOURS : Community service workers sign in and out each time they come. A log of the hours and minutes as well as what tasks they performed is kept. Upon completion of the community service a letter is printed. This letter is to be picked up the next Dream Catcher Stables business day (Saturday or Sunday). Alternatively a stamped, self-addressed envelope may be provided to Dream Catcher Stables and the letter will be sent.